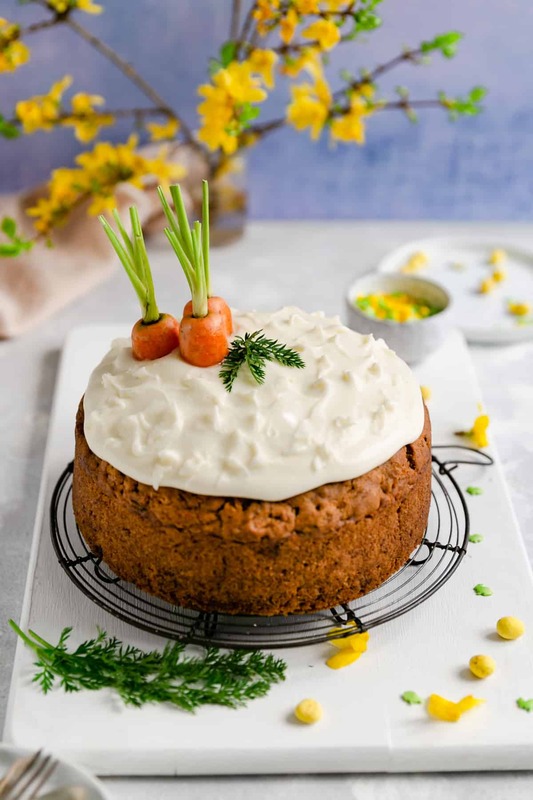 This easy carrot cake doesn’t require much effort to prepare, yet it’s effective enough to become a centrepiece on your Easter table. Your guests will never know it’s vegan! Happy new week! I honestly find it hard to believe that we are now well into Spring and Easter is just around the corner. Every year it just kinda creeps up on me and takes me by surprise! Also, another thing that I find hard to believe, is that my blog is turning 3 this April! 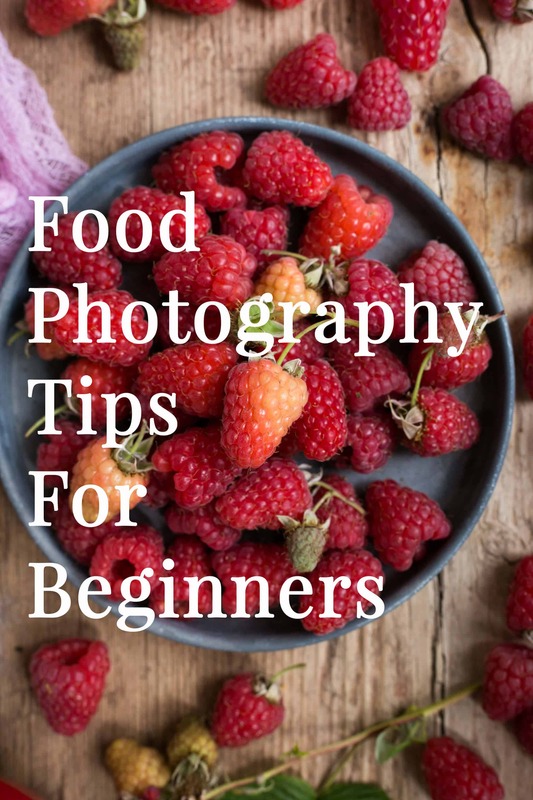 Yup, it’s been 3 years since I’ve started this little space with my photos and recipes, so I thought it will be a good time to celebrate with some cake! 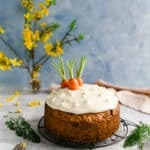 As we are only couple of weeks away from Easter, I thought this easy vegan carrot cake recipe will come handy. Because we all love a bit of a carrot cake during Easter holidays, right? That, plus the fact that I actually do not have a recipe for this classic in my collection yet! (But just in case if carrot cake is not your cup of tea, this White Chocolate Cake will also be great for Easter). What I love about this carrot cake is that it requires so little effort to make, yet it never fails to impress the guests. Few simple ingredients, two bowls and an oven. That and it’s flavour! Delicious, sweet carrots mixed with aromatic spices topped with sweet, creamy and fluffy frosting. You can be as creative as you want with the toppings and decorations, or keep it simple and use the vanilla cream cheese frosting on its own. Either way, the cake will taste delicious! As with most of vegan cakes, it’s important to find the right bonding ingredient to replace the eggs. In this recipe, I’m using an apple sauce. It’s a great alternative, and works so well in pretty much most of the vegan cakes. Check out the notes in the recipe card for my simple homemade apple sauce method. As for the rest of the ingredients, let’s split them into ‘dry’ and ‘wet’ ones. From the dry ones, we need some plain, all-purpose flour, baking powder, baking soda, some salt and aromatic spices. I’m using ground cinnamon and mixed spice, but feel free to experiment with your favourite spice selection. Wet ingredients include grated carrots (I’ve used some organic carrots with tops, because I like to use the carrot tops as decoration on the finished cake), olive oil (or vegetable oil), apple sauce and brown sugar (I know, technically this is a ‘dry’ ingredient). Frosting is made of vegan cream cheese, vegan spread or butter, vanilla paste and icing/ powdered sugar. Make sure all of these ingredients are at the room temperature, as otherwise you may end up with some lumps and bumps! How do I make easy vegan carrot cake? The method couldn’t be simpler! Tip all the dry ingredients (apart from sugar) to a large bowl and mix well. Do the same with the wet ingredients. Add dry mix to the wet one and stir until JUST combined. Like with any cake batter, do not over-mix it, as it will result in more dense, chewy texture. Pour the cake batter into prepared ‘springform’ tin (loose-bottom) and bake for about 50- 60 minutes until it’s golden-brown or skewer inserted in the middle of the cake comes out clean and dry. If the cake starts to brown up on top, simple cover it with some aluminium foil to prevent it from burning. Allow the cake to cool down completely before topping it with the frosting. As always, thanks for reading today’s post! I hope you will try this easy recipe, and that you will enjoy it as much as I do! Remember to leave me a comment below and follow me on my Instagram, Facebook or Pinterest too! 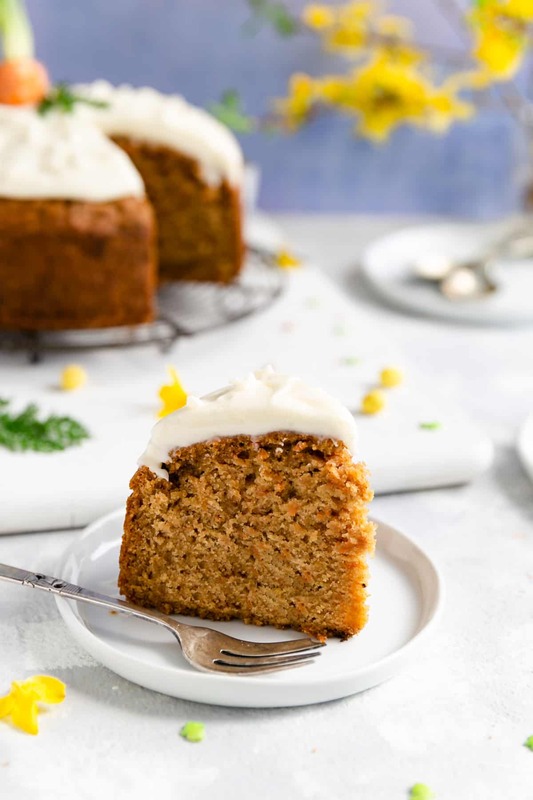 This easy vegan carrot cake requires very small effort to make, yet is effective enough to make a centrepiece on your Easter table! Delicious combination of soft, fluffy and moist sponge topped with light and sweet vanilla cream cheese frosting. Add the flour mixture to the carrot mix, and stir all together until just combined. Do not over-stir. Pour the mixture into prepared baking tin and bake in the oven for 50- 60 minutes, until golden brown or until skewer inserted n the middle comes out clean. Cool down for 10 minutes, then remove from the baking tin and allow to cool completely on a wire rack. Meanwhile, prepare the cream cheese frosting. Beat all the ingredients together until light and fluffy. If the frosting feels too runny, add more icing sugar. Spread the frosting on top of the cake. Enjoy! To make an apple sauce, simply peel and core 3 medium apples. Cut into cubes and place in a medium saucepan. Cover with 250 ml (1 cup) of water. Add 1/2 tsp cinnamon, 2 cloves and 1/2 tsp mixed spice. Cover with lid and simmer for about 20 minutes, or until the apples are soft. Blend the apples into a soft puree with hand blender or mash them with potato masher. If you would like to receive my new posts and recipes straight to your inbox, make sure to hit that ‘subscribe’ button! Let’s be pals! Hey Tania! Thanks so much for your lovely comment! I’m gonna make you this carrot cake next time I see you, now that I know it’s one of your favourite! Have a great week babe! What I really love about this is how you made real big raw carrots look magical as a decoration! That’s a HUGE win! Thanks so much Kari, so glad that you like that decoration on the cake! It’s a great way to reduce food waste and make the best use out of the carrot tops! What a beautiful cake! 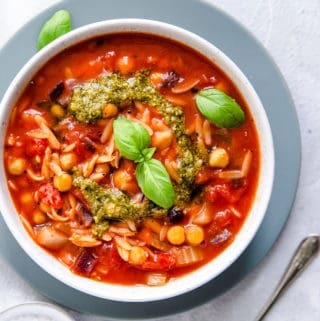 I need to make it this weekend since a have a family member that is vegan and she will love it! Me too of course lol! Thanks for sharing Anna! Yes! I love applesauce in cakes so much! Your cake looks so moist and tender! I’m always looking for vegan desserts to make friends. This will be made for Easter! Hey Lori, thank you so much for your comment. Apple sauce is such a great alternative to eggs, and works so well in most of the recipes. Glad to hear that you are also a fan! And I hope you will enjoy this carrot cake during Easter holidays! Happy Blogaversary!! Doesn’t it fly by? Your carrot cake looks so delicious Anna!! Even though I’m no longer vegan, I still like making vegan cakes or dishes. I can’t wait to try your cake! Carrot cake is my absolute favourite! 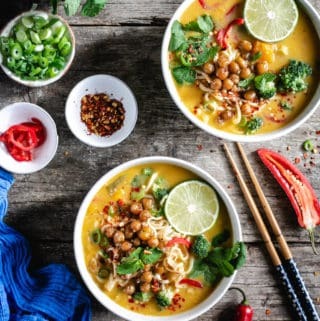 I’ve never seen a vegan version – yours looks SO good! I wish I had a slice right now! Hey Katherine, thank you so much for your comment. If I was given a slice of this cake, I wouldn’t even know it was vegan! Honestly, you won’t taste the difference! And I would love to share a slice with you! Yay! That makes me so happy to hear Kylie! Hope you will enjoy this cake over Easter holidays!Thanks for stopping by! One of my cousins is vegan and never gets to enjoy a ton when we get together for holidays. Gonna make this so that she and the whole family will be happy! Thanks! That’s so great to hear Lorie! I hope you and the whole family will enjoy this bake over Easter! Thanks for your comment gorgeous! I really like how you garnished this adorable cake! It’s simple but really cute, and would be perfect for Easter. Thanks for the recipe! Pleasure all mine Kate! Glad to hear that you like the cake and the ‘decoration’! Have a great weekend! This recipe looks and sounds absolutely delicious. I love how you’ve decorated it and shot the photos. Gorgeous! thank you Jenni! Glad you like the recipe and the photos! Hugs. What a cute presentation. The cake looks delicious and since I’m not a Vegan I didn’t realize you could use applesauce in place of eggs. I’ve used applesauce in place of the fats and it’s worked well. I’m definitely trying out this recipe. It looks delicious and moist. What a great treat! Hey Marissa! Thanks so much for stopping by! Apple sauce will work great as a bonding agent in place of eggs, however, it won’t work as a raising agent, like eggs do in some recipes. Hope you will try this carrot cake some time soon, it’s so delicious! 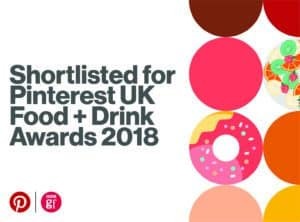 Always looking for vegan dessert ideas for my clients and this one looks like a mega winner! Thanks so much for sharing :). Def keeping this noted for my next vegan dessert party! Hey Daniela! Thanks so much! 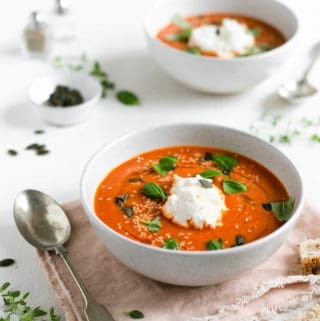 Very happy to hear that you like this recipe and that you will be trying it out! OMG…this carrot cake is sooo pretty!